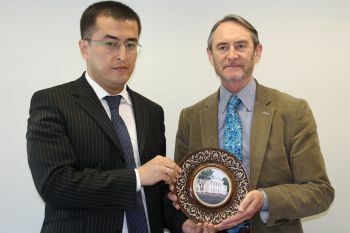 Headed by Uzbekistan’s envoy to London, H.E. Dr Alisher Shaykhov, the visiting representatives discussed a stronger relationship between the City Law School and the Tashkent State University of Law. The City Law School (CLS) is strengthening its links with Uzbekistan through a partnership to consider the joint provision of legal education, training and academic exchange with the Tashkent State University of Law (TSUL). H.E.Dr Alisher Shaykhov, visited CLS. He was accompanied by; Dr Mansurkhon Kamalov (Deputy Rector of the Tashkent State University of Law); Dr Mansur Musaev (Head of Department, TSUL) and Dr Jamshed Safarov (Counsellor in London’s Uzbekistan Embassy). The Uzbek delegation met with Professor Chris Ryan (CLS Dean); Professor Jason Chuah (CLS Head of Academic Programmes); Professor Elaine Fahey (CLS Associate Dean, International); Professor Susan Blake (Associate Dean); Dr Tawhida Ahmed (CLS Associate Dean, Research); Mark Hertlein (City’s Head of International); and Rolf Jesperson (Co-Head of International Student Recruitment). 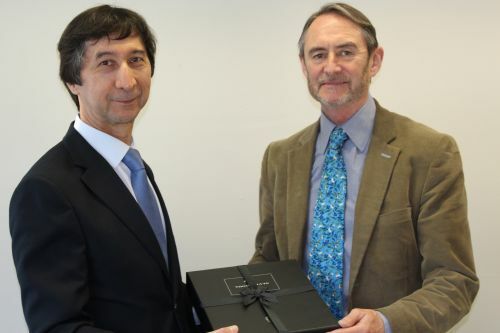 Ambassador Shaykhov has been Uzbekistan’s Ambassador to the United Kingdom since April 2017. He was delighted to have been welcomed by academics and officials at the City Law School and stated that his delegation succeeded in “putting the bricks in place to build a proper edifice of cooperation to benefit our respective institutions”.